Under the leadership of the Prime Minister, Shri Narendra Modi, the country has witnessed its best phase of macro-economic stability, becoming the sixth largest economy in the world from being the 11th in the World in 2013-14. Presenting the Interim Budget for the year 2019-20 in Parliament today, the Union Minister for Finance, Corporate Affairs, Railways & Coal, Shri Piyush Goyal said "India is the fastest growing major economy in the world" with an average GDP growth of 7.3% per annum, the highest ever achieved by any Government since economic reforms began in 1991. Shri Goyal said under the leadership of Prime Minister, Shri Narendra Modi, a clean, decisive and stable Government reversed the policy paralysis, laid foundation for sustainable growth and restored the image of the country. Highlighting the Banking Reforms, Shri Goyal said the Insolvency and Bankruptcy Code has institutionalised a resolution-friendly mechanism and nearly Rs. 3 lakh crores (Rs.3 trillion) has been recovered by Banks and creditors. He said high stressed non-performing assets (NPAs) amounted to Rs. 5.4 lakh crore (Rs.5.4 trillion) in 2014. Since 2015, numerous Asset Quality Reviews and inspections were carried out, and the 4Rs approach of recognition, resolution, re-capitalisation and reforms has been followed. Highlighting the restoration of the health of the Public Sector Banks, the Finance Minister said that recapitalisation has been done with an investment of Rs. 2.6 lakh crore (Rs.2.6 trillion). To provide food grains at affordable prices to the poor and middle classes, the Finance Minister said about Rs 1,70,000 crore (Rs.1.7 trillion) was spent in 2018-19. Rs 60,000 crore (RS.600 billion) has been allocated for Mahatma Gandhi National Rural Employment Guarantee Act (MGNREGA) in the Budget Estimate of 2019-20. The Union budget 2019-20 gives a clear vision for further improving the ease of doing business by committing increased investment to projects relating to key infrastructure projects which would reduce the cost of transactions for India's exports, said EEPC India chairman Mr Ravi Sehgal. Be it roads, sea ports, airports, roads and railways under different flagship programmes like Sagarmala projects, they would all help reducing the time for the container movement right from the source of the shipment to the export destination, Mr Sehgal said. The EEPC India chairman also lauded the interest subvention for the SMEs up to two per cent. He said, while the exporters endorse and applaud the GST as the biggest tax reforms in the country, implementation machinery needs to be further pruned so that the exporting sector can fully take advantage of the rationalisation of GST rates. The infrastructure development must be done year after year, incrementally to make India's exports competitive, so that the export growth which had been slackening can revive sooner than later. EEPC India have also lauded a big initiative for technology upgradatation with the help of emerging artificial intelligence. The setting up of National Artificial Intelligence would be a big initiative forward. EEPC India is already working on several technology related projects for upgradation. The total exports of finished steel have grown by 16.7 per cent in 2017-18, the Minister of State for Steel, Mr Vishnu Deo Sai, informed the Lok Sabha on Monday. The details are as shown in the table. The contribution of the non-alloy steel segment in total finished steel exports stood at 8.727 MT. The break-up of finished steel exports in 2017-18 is as shown in the table. and mixtures shipments rose to USD 5.36 million in the last financial year from USD 2.73 million in 2016-17. Oil-rich Kuwait is planning to double its investments in India from the current five billion dollars taking advantage of the country's growth story and also exploring third country joint projects with Delhi. Historically, Indo-Kuwaiti relations have always had an important trade dimension. India has consistently been among the top ten trading partners of Kuwait. During 2017-18, Kuwait was the ninth largest oil supplier to India and it meets about 4.63% of India's energy needs. "India is looking for a substantial Kuwaiti investments in oil & gas sector. Large business houses of Kuwaiti also have investible surpluses," according to Ministry of External Affairs (MEA) brief on India-Kuwait ties. Total non-oil bilateral trade between India and Kuwait increased by about 11%, from $ 2,150.63 million in 2015-16 to $ 2,405.40 million in 2017-18. India's non-oil exports to Kuwait are showing a positive trend for the past few years. Non-oil export from India to Kuwait increased by about 19.60%, from $ 1,240.54 million in 2015-16 to $ 1,361.06 million in 2017-18, according to MEA. Total bilateral trade with Kuwait during 2015-16 was $ 6.2 billion. India's exports to Kuwait grew by 4% ($ 1.24 billion) in 2015-16 vis-a-vis 2014-15. India's exports to Kuwait included food items, cereals, textiles, garments, electrical and engineering equipment, machinery and mechanical appliances, cars, trucks, buses, tyres, chemicals, jewellery, handicrafts, metal products, iron and steel, etc, the MEA brief added. Kuwaiti investment in India has been largely indirect through portfolio managers. In December 2015, KIA announced an investment of $ 300 million in GMR Infrastructure Ltd. Earlier, in October 2015, KIA made a substantial investment in the Interglobe Aviation's (Indigo Airlines) IPO, according to the MEA brief. "In 2013, KIA had made an investment of $ 5.37 million in the Power Grid Corporation of India Ltd. Other significant Kuwaiti presence in India includes those by Alghanim Group of Kuwait; the KAPICO group; National Aviation Services; Agility Logistics, Hasibat Holding Co, KGA Group, KCIC, KIPCO, Global Investment House, Kuwait Finance House etc. India related funds launched in Kuwait include India Fund (October 2005); Tijari India Fund (December 2006); India Equity Fund (January 2007); Kuwait Indian Holding Company; India Private Equity Fund; 3rd Real Estate Islamic Fund (May 2007); and Mayur Hedge Fund (August 2008). Hydrocarbon sector : Kuwait remains a reliable supplier of crude oil &LPG to India, meeting our crucial energy needs." Indian PSUs like TCIL, LIC (International), LIC Housing Finance, New India Assurance Company, Oriental Insurance Company, Air India Ltd. (Air India and Air India Express) have offices in Kuwait. During the last two years, Indian EPC companies viz. Larsen & Toubro, Shapoorji Pallonji, Dodsal, Punj Lloyd, Simplex Projects, Essar, Kalpataru etc. were awarded EPC contracts worth over $ 6 billion in Kuwait. The Energy & Resources Institute (TERI) is executing Kuwait Oil Company (KOC)'s soil remediation project worth $ 39 million. According to IMF estimates, Kuwait's Nominal GDP in 2016 was $101.524 billion and GDP per capita (PPP) was $ 70,165.99 in 2015. It has a Sovereign Wealth Fund (SWF) of over $ 592 billion, which is managed by the Kuwait Investment Authority (KIA), according to the MEA brief. These assets are held in 2 state-owned sovereign funds: the Reserve Fund for Future Generations (RFFG) and General Reserve Fund (GRF) to which Kuwait has been transferring 10% of its total revenues since October, the brief added. "It is understood that in June 2017 KIA invested US$ 87 million invested as a consortium along with Nomura in Wells Fargo, HSBC in AU Small Finance Bank. Also, in June 2017, KIA was one of the 15 Anchor investors who participated in the IPO of Dixon Technologies, a Noida based Electronic manufacturer. They bought shares worth Rs 12.5 crores ($ 2 million)Kuwait's National Petroleum Services Company (Napesco) opened their first company in India, 'Napesco India', a limited liability company with a capital of about Rs.50 million ($ 7.8 lakh) at Chennai Special Economic Zone," informed MEA brief. India has formally established a shipping link to Chabahar with the recent arrival of the first such ship, a 3,700-TEU box vessel, to the port. This was announced in a release from the Iranian Prime Minister's office, as per reports in the Iranian media. It has been decided that regular ships from three Indian ports - Mumbai, Kandla and Mundra - will now regularly go to the Iranian port every two weeks, reports added. Hoegh Autoliners was the proud recipient of the "Shipping Line of the Year - RoRo Operator" award at Exim India's BHP-MALA 2019 International Conference & Awards, focusing on break-bulk, heavy lift and project forwarding, held on January 31, 2019 in Mumbai. As per a release, the premier event has carved a niche for itself as the definitive recognition of excellence in the Indian maritime and logistics sector, with focus on the break-bulk, heavy lift and project forwarding segment. This was the first time that the conference was followed by an awards ceremony to recognise the industry leaders in this sector. Mr Karolath Gopinath, Head of Sales India, says, "We are honoured to have been awarded the "Shipping Line of the Year - RoRo Operator" at this prestigious event. The award is recognition for the safe, professional and cost-effective service we offer our customers in the transportation of break-bulk and project cargo. The accomplishment comes down to the excellent performance by our team, as well as the continued support we receive from our customers." Capt. Atuldutt Sharma, Breakbulk-Sales Manager, Hoegh Autoliners (India) Pvt. Ltd, accepted the award on the occasion. The event also saw representatives from logistics service providers, shipping lines and customers discuss topics such as global best practices, market innovations and future growth prospects in the break-bulk, heavy lift and project cargo industry, the release added. The government has increased the proposed investment in 17 enterprises under the shipping ministry to Rs 5,778 crore (Rs.57.7 billion) for 2019- 20 in order to boost the 'blue economy'. The estimated investment in these enterprises that include 12 major ports is Rs 5,548 12 crore (Rs.55.4 billion) in 2018-19, according to the revised numbers in the recent budget document. The government had proposed an investment of Rs 5,079.80 crore (RS.50.7 billion) in the Budget for 2018-19. 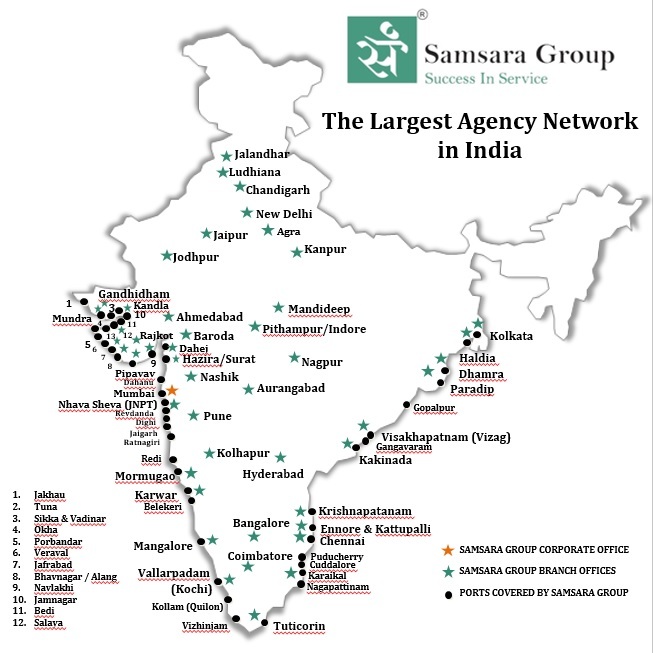 The 17 entities also include Inland Waterways Authority of India, Shipping Corporation of India, Dredging Corporation of India and Sagarmala Development Company. The government said of the Rs 5,777.79 crore (Rs.57.7 billion) investment proposed, Rs 5,577.79 crore will be met through Internal and Extra Budgetary Resources (IEBR). "Our efforts in the Sagarmala programme will be scaled up and we will develop other inland waterways faster. Our coastline and our ocean waters powering India's development and growth are few dimensions of the government's vision," he said. The Sagarmala initiative is a positive step by the government towards transforming the nation through port modernisation. Projects identified under Sagarmala programme are expected to mobilise more than Rs 8 lakh crore (Rs.8 trillion) of infrastructure investment, double the share of domestic waterways (inland and coastal) in the modal mix. The initiative will lead to logistics cost savings of Rs 35,000-40,000 crore (Rs.350-400 billion) per annum, boost merchandise exports by USD 110 billion and enable creation of 1 crore (10 million) new jobs, including 40 lakh direct jobs, in next 10 years, according to the government. The Container Corporation of India Ltd (CONCOR), a Navratna company under the Ministry of Railways and a market leader in container operations and multimodal logistics services in India, and JSC RZD Logistics (RZDL), a Russian rail company, have agreed to jointly develop multimodal logistics services along the International North South Transport Corridor (INSTC) route. JSC RZD Logistics is the biggest multimodal logistics operator in the CIS and Baltic countries, highlighted a release. The MoU, signed on January 30, 2019, aims to explore opportunities in developing joint logistical projects both in India and in Russia using international transport corridors, to include, in particular, the International North South Transport Corridor. The agreement was inked by the Chairman and Managing Director of CONCOR, Mr V. Kalyana Rama, and the CEO of JSC RZD Logistics, Mr Viacheslav B. Valentik. With the signing of this MoU, both the companies intend to jointly enhance India-Russia logistical cooperation, develop prospective projects related to container transhipment between the countries, design new top-quality logistical services and aim at further improving efficiency on the INSTC route. CONCOR's partnership with JSC RZD Logistics is a strategic move in terms of Eurasian multimodal logistics markets. The strategic alliance would strive to design innovative new initiatives to reduce the total logistics cost of international trade, enhancing logistical efficiency and bilateral relations. The volume of import-export business between Russia and India has been constantly growing over the years. Given this potential, both countries have interests in developing state-of-the-art logistical services, including along the INSTC. With INSTC being a prospective project, which is already turning out to be one of the most important transport arteries of Eurasia, the signing of the MoU will promote further cooperation and trust between the two nations, emphasised a release. The recently-released Draft Logistics Policy aims at integrating and optimising various elements of the logistics value chain, to ensure seamless, multimodal growth of an efficient logistics sector in the country, as per the Commerce Ministry document. The Ministry has sought the views of stakeholders on the policy by February 19, 2019. Some of the measures proposed in the policy are setting up of a separate fund for start-ups in the sector, single-window e-marketplace for logistics and a law to define the role of various stakeholders. Among the other thrust areas are focusing on critical projects to enable first mile and last mile connectivity, proper development of multimodal logistics parks (MMLP), interventions to reduce logistics cost, promote efficiency for movement of key commodities, and setting up a Logistics Data and Analytics Centre. The proposed non-lapsable logistics fund can be deployed for providing viability gap funding for select MMLP projects, first and last mile projects and projects for poorly-serviced remote areas, incentivising select logistics skilling programmes, and setting up a start-up acceleration fund to incentivise development of new technology, the policy said. A framework act on integrated logistics will be enacted to define the role and responsibilities of all stakeholders in the multimodal logistics space, it said. "This will institutionalise the defined roles of the relevant stakeholders as per the national logistics policy," it added. The draft has also suggested constitution of four committees or councils, including the National Council for Logistics, chaired by the Prime Minister; an apex inter-ministerial committee, chaired by the Minister of Commerce and Industry; an India Logistics Forum chaired by the Commerce Secretary; and an empowered task force. This is required as the logistics wing under the Ministry would be requiring extensive coordination, data gathering and monitoring across Central Ministries, including Roads, Railways, Shipping, Civil Aviation, Food Processing, Finance and Home Affairs, it said. The Council (chaired by the Prime Minister) will provide overall direction and guidance for the integrated development of logistics in the country. Further, it will review the progress made against the Integrated National Logistics Action Plan every six months. The creation of a national logistics e-marketplace as a one-stop marketplace will involve simplification of documentation for exports/imports and digitisation of processes, the policy said. "An effective and efficient logistics ecosystem can be a key contributor to robust economic growth in the country, with the potential to facilitate domestic and foreign trade, promote global competitiveness, enhance incomes, and drive the Make in India initiative," it emphasised. Among the aims is also to reduce losses due to agri-wastage to less than 5 per cent and bring down logistics cost as percentage of GDP from the current levels of 13-14 per cent, reports said. Cochin Port handled 2.857 million tonnes (mt) of cargo in January 2019, its highest-ever monthly throughput. The previous highest was 2.825 mt, achieved in January 2018. The cumulative handling of cargo during April 2018 to January 2019 was 26.148 mt, 8 per cent higher than during April 2017 to January 2018. The ICTT at the port handled 55,953 TEUs in January 2019, again the highest-ever monthly container handling at Cochin Port. The previous highest was 52,476 TEUs in March 2018. The cumulative number of containers handled during April 2018 to January 2019 was 482,880 TEUs, 5.11 per cent higher than the comparative period of the previous fiscal. The container freight station (CFS) of Cochin Port Trust handled 391 TEUs in January 2019, 13.66 per cent higher than the containers handled during January 2018. The cumulative number of containers handled at the Port CFS during April 2018 to January 2019 was 3,662 TEUs, 0.11 per cent higher than during April 2017 to January 2018. The port continues to be the most sought after destination for international cruise liners. Eight cruise vessels called at Cochin Port during January 2019. The total number of cruise vessels visiting Cochin Port during 2018-19 is expected to be 50, which again is the highest-ever number of cruise calls, informed a release. Handles over 25,000 TEUs & 26 vessels, besides longest-ever vessels Kandla International Container Terminal Pvt. Ltd (KICTPL), one of the flagship projects of the J. M. Baxi Group, yet again achieved new records when it crossed 25,000 TEUs and handled 26 vessels in January 2019, just two years from the commencement of commercial operations. KICTPL, being the closest terminal to the northern and western hinterlands of the country with an exclusive on-dock rail facility, had already created a series of records in January when it handled M. V. Zardis with a LOA of 304.07 m, M. V. Behta with 299.20 m and M. V. Basht with 294.10 m, which were the longest vessels to be handled at Kandla. On this occasion, Team KICT extended its gratitude to all the trade members who believed in the terminal, and all the vendors who supported the facility throughout. The team looks forward to showcase many more surprises in 2019 and establish the terminal as a low-cost, international-standard gateway for the trade at large, emphasised a release. The addition of a weekly intra-Asia call from HMM has significantly brightened the growth outlook for PSA International's new terminal at Jawaharlal Nehru Port Trust (JNPT), India's busiest Container gateway. The Singapore-based terminal operator opened Bharat Mumbai Container Terminals (BMCT) in February 2018, with a capacity of 2.4 million TEU annually in its first phase. HMM's independent, six-vessel China-India Express (CIX) Service debuted at BMCT with a call from the 8,562-TEU Hyundai Loyalty on Jan. 2. The inaugural call notched an impressive berth productivity rate, handling 8,540 TEU (both import and export container moves) during the ship's 42-hour stay. With that as a backdrop, BMCT hit a new volume high in January of 67,661 TEUs, a 56.4 percent gain from 42,252 TEUs in December, according to statistics collected by JOC. The growth largely came from large-scale liftings on CIX calls apart from more ad-hoc calls, with BMCT servicing 22 ship calls in January - the highest-ever monthly number - compared with just 11 calls in December, statistics show. The full port rotation of the CIX is JNPT, Mundra, Karachi, Port Klang, Singapore, Hong Kong, Gwangyang, Busan, Shanghai, Ningbo, Shekou, Singapore, and back to JNPT. "BMCT, with its advanced technology and infrastructure, is highly capable to accommodate 13,000-TEU vessels, which are a part of HMM's recent mega vessel project to continuously bring even more bigger sized container vessels to boost the export-import trade in India," H. J. Sung, Managing Director of HMM India, stated when launching the CIX call at BMCT. New berthing data obtained by JOC also suggest other carriers and alliances operating to and from JNPT are poised to deploy some ad-hoc calls at BMCT this month, including the CMA CGM Norma and the Xin Fei Zhou arriving on Feb. 10 and Feb. 17, respectively. Both vessels are part of the CI-1 (China-India) loop operated jointly by Cosco Shipping Lines, CMA CGM subsidiary APL, and OOCL. January rail movement and transshipment figures also bode well for the new terminal. BMCT handled 7,680 TEUs by train (2,991 export TEUs and 4,689 import TEUs), compared with 5,112 TEUs (2,344 export TEUs and 2,768 import TEUs) in the prior month, while January transshipment volume increased to 3,428 TEUs, from 2,262 TEUs in December, according to the collected data. A slew of mega projects of Indian Oil (IOCL) and Paradip Port Trust (PPT) worth over several crores will be unveiled today at Paradip in Odisha. The projects are slated to be launched in the presence of Union Road Transport & Highways and Shipping Minister, Nitin Gadkari, Union Tribal Affairs Minister Jual Oram and Petroleum Minister Dharmendra Pradhan. IOCL's state-of-the-art 15-MMTPA refinery will take a leap forward with the inauguration of a Polypropylene (PP) plant built at an investment of Rs 3,150 crore (Rs.31.5 billion). Regarding projects in Paradip Port, the officials said a Multipurpose Berth developed for handling clean cargo, including containers, and for diversifying its cargo profile will be launched. The capacity of the terminal is 5 MMTPA and the estimated cost of the project is Rs 430.78 crore (RS.4.3 billion). A dust suppression system completed at a cost of Rs 17.50 crore (Rs.175 million) will also be launched in the mechanised coal handling plant. Foundation stones will be laid for several projects, including mechanisation of berths to enhance their capacity to 30 MMTPA, enabling cargo handling of thermal coal exports in an eco-friendly manner through closed conveyor system, at a cost of Rs 1,437.76 crore (Rs.14.3 billion). Similarly, a new coal berth will be developed for handling of coal imports at Paradip Port on BOT basis at an estimated cost of the project is Rs 655.56 crore (Rs.6.5 billion). Among other projects at the port are installation of Container Scanner with a project cost of Rs 40 crore (Rs.400 million) and a second exit from PPT including flyover to reduce traffic inside city area and provide improved connectivity at a cost of Rs 94 crore (Rs.940 million). A Multi Modal Logistics Park being developed an estimated cost of Rs 200 crore (Rs.2 billion) over an area of 100 acres will also be launched in Paradip.